What if Google ends Feedburner? | NewbieTechTips! What if Google ends Feedburner? It's another RSS based service like Google reader. And Google is losing interest in RSS based services. There is no update in the feedburner platform for a long time. Google is closing down associated products of feedburner. There have been a lots of talk on this matter over the blogosphere in past few months. Read what Techcrunch has to say on this. So many bloggers are now finding in advance some alternative to feedburner. But l am afraid to say that I could not find any other free service comparable to feedburner around over the internet. There are some free services which can be used in place of feedburner for email based subscription service but none is comparable. If we look at paid services, we can find even better email services than feedburner. 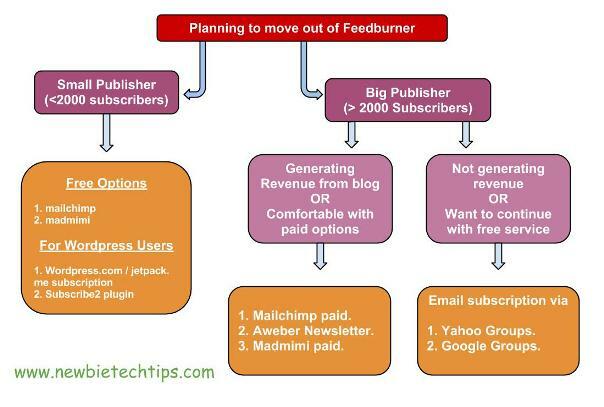 You do not have to worry about the end of feedburner very soon, and in my option Google will not shut it down for at least next few years, the reason is millions of blogs on blogger.com platform relies on feedburner for their email subscription need and ending feedburner will affect those blogs adversly, so till Google makes some alternative arrangement, we can enjoy feedburner as it is. If one day the times comes (I hope it will not), when Google announce end of feedburner, we should be prepared to find some alternative to it. So let's look at some Feedburner Alternatives. The alternative to feedburner primarily depends upon the importance of email subscription for your blog or site. If email subscribers make a big part of your blog readers it's better to go with more stable and paid option, so that you won't compromise your traffic to the blog. Are you ready to move to a paid service? And just as advice I suggest to download the subscriber's list from feedburner on a regular interval. Madmimi is also an email newsletter service similar to mailchimp. It gives 2500 subscribers or 12500 emails per month free. If you need more you can opt for paid options. It also has a free RSS to Email plugin, which can be used to send blog posts via email. One issue I faced with madmimi is the emails land up in spam folder in many cases. Both Google and yahoo groups can be used as a free alternative to feedburner. They are not as good as feedburner or above services (mailchimp or madmimi) but can be used freely for a large no. of subscribers. Yahoo Groups provide option for subscription form for your blog while recently Google groups has stopped such support. I will discuss in detail, how to use these as automatic newsletter in one of my other post. Aweber is an email newsletter service. But it has no free option and may not be good for beginners or who do not generate revenue from their blogs. If you are using wordpress.com as your blogging platform then you can use the default wordpress.com email subscription option. If you have a self-hosted wordpress then this can be achieved by jetpack plugin which is available free for all wordpress.org users. This is also a plugin for wordpress.org users. This plugin will send email for each post to your subscribers. My advice is to check with the hourly email limit of your webhost in case you are planning to use this. Most of the shared web hosting have a hourly and daily email limits set to prevent abuse and if you have a huge subscribers list or if you post content very frequently, you may exhaust the email limit and can get blacklist. ## There are many other newsletter plugins available free for wordpress, but I have included the most popular here. You can search for newsletter in the Plugin directory of wordpress if you need more. Other options which can be considered are…. One more thing which I like to mention, but it is not exactly the email subscription substitute is to promote your blog more and more on social media and to get more and more followers on social media like Twitter and Facebook. Now the blogosphere is becoming more and more social, Social networks are one of the most powerful tool to get returning visitors. Let me know if I have missed any other free alternative to feedburner, via comments.